Pain now - gain later? Prohibition of the right and left hand turn into Derriford Hospital at the mini roundabout. All traffic diverted to the second entrance into the Hospital. Plymouth City Council will shortly be issuing a press release advising the public about the works at Derriford and further schemes which will be delivered on Tavistock Road over the same period. 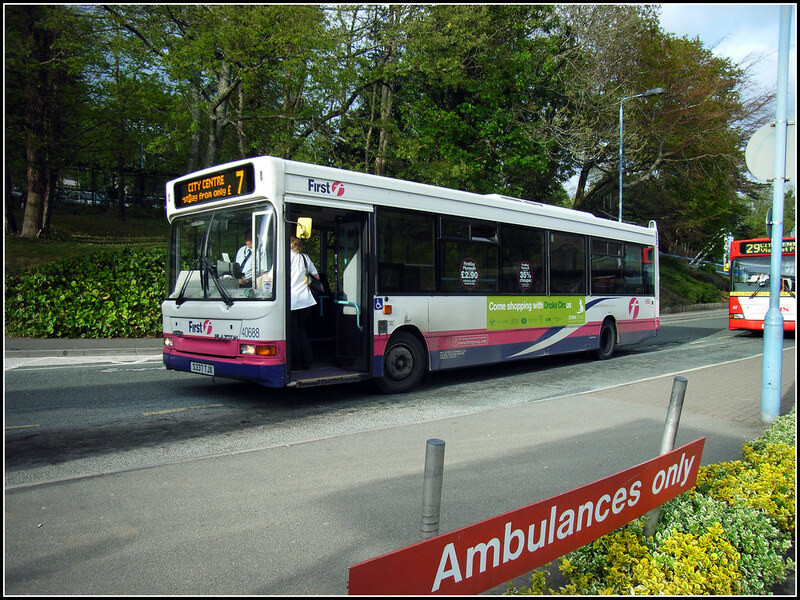 In the notice Plymouth City Council will be advising the public to use public transport to access both the Hospital and the City Centre during the construction period or, where this is not possible, to consider alternative routes or times of travel. For information on public transport serving the Hospital is available from traveline and PlymGo, please see details below. I should add that staff at Derriford Hospital itself have yet to receive anything but i am sure this will come out very shortly. Work gets underway on Monday 16 November to create a new section of bus lane at one of the two entrances into the hospital grounds. The £300,000 project, which is expected to be completed by February, will connect with the existing bus lane on Derriford Road. The project is one of key improvements planned for the city’s Northern Corridor (the main route from Woolwell into the city centre) to be delivered by the Council this year. Once complete, it will improve journey time and reliability for people using buses to the hospital as well as provide better pedestrian access. I do like the line "will spell the end of buses queuing to get in and out of the hospital grounds". I can see how it will help buses getting out but not so sure how it will help them get in? We all know that traffic around Derriford is going to get a lot worse while these works continue. A lot of the traffic from Derriford Hospital will be directed out via Morlaix Drive which is very narrow. At the moment it is two way traffic but I guess this will have to be made one way for the duration of the works. This will then impact on the hospital staff park and ride service. Trying to get out onto Derriford Roundabout from this end is bad enough as it stands at the moment without all the extra traffic from the hospital trying to get out this way too. Between June 2009 and March 2010 Plymouth Transport and Highways are undertaking transport improvement works in seven sections on the corridor. The George Park and Ride entrance has already been opened and certainly makes it easier for us to use it. The Tamar Link service was only recently actually cut back to every two hours! The other sections are noted on their web site. I do hope that the extra bus lane does make a difference - it certainly should save a lot of time as buses can queue for ages to get out of Derriford Hospital. Making it a one way system should also make a difference and improve the flow of traffic. I am just dreading the journey home over the next few months! A better link to the local traveline website is www.travelinesw.com it saves time going through the nasty front page.